My summer took a completely different turn than expected. I was supposed to be interning in London for six weeks and a top event venue in Central London. However, a small “technicality” kept me from entering at the border. To make a long story short, I should have had a work visa… no one realized I needed this prior to leaving… therefore, I didn’t have the “proper” documentation and I wasn’t allowed into the UK. Instead of frolicking across the pond, my dear friend Jillian saved the day by inviting me out to help them at the Reno Rodeo. 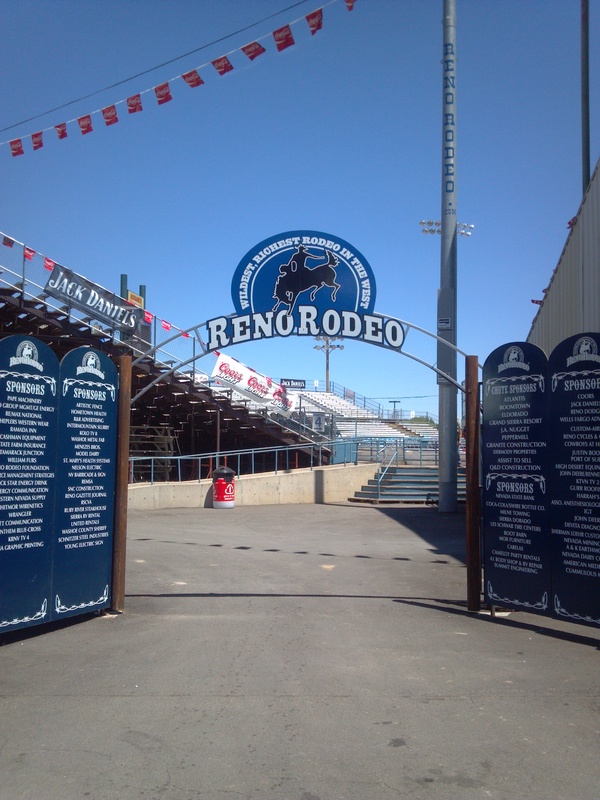 Coined the “Wildest, Richest Rodeo in the West,” this 10-day event brings in 140,000 fans to enjoy this popular sport of the cowboys (or cowboy wanna-be’s). And with all these people, somebody has to feed and drink them… that’s where my friend’s dad comes in. He is in charge of ALL the food and beverage for the event. 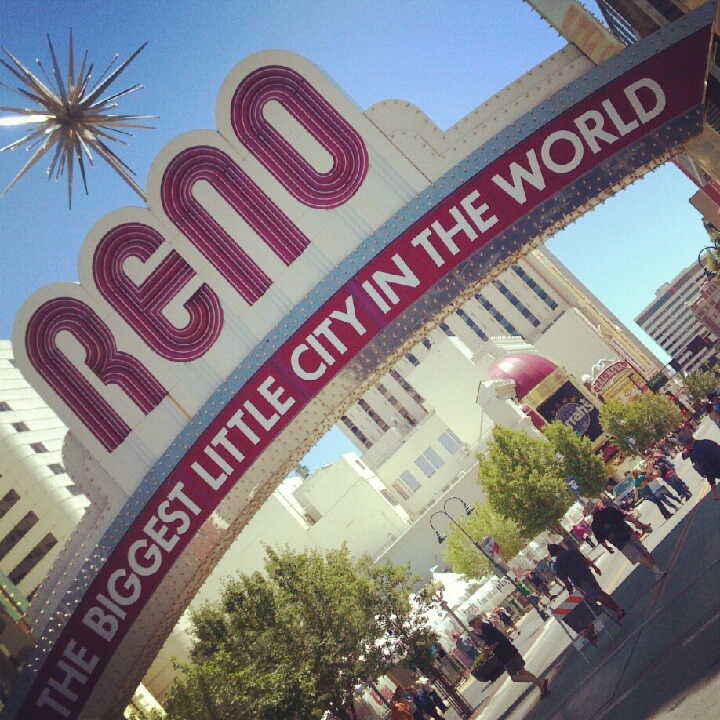 So, I packed my boots and headed out to Reno! I have no words to express the greatness of this cake! The cake was so moist. The frosting was a peanut butter and honey frosting. I think that says enough! 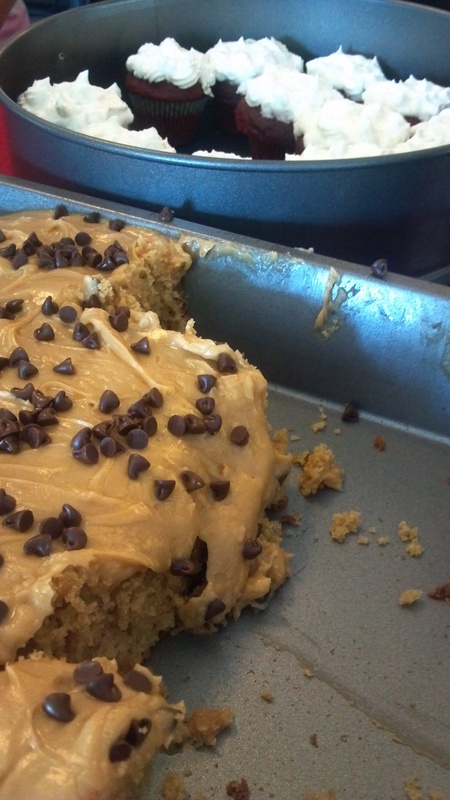 It melted into the cake, making it one happy combination on my taste buds. To top it off, it was sprinkled with chocolate chips. My mouth is watering just thinking about it! I can’t help but think I had something to do with Mallory making these. 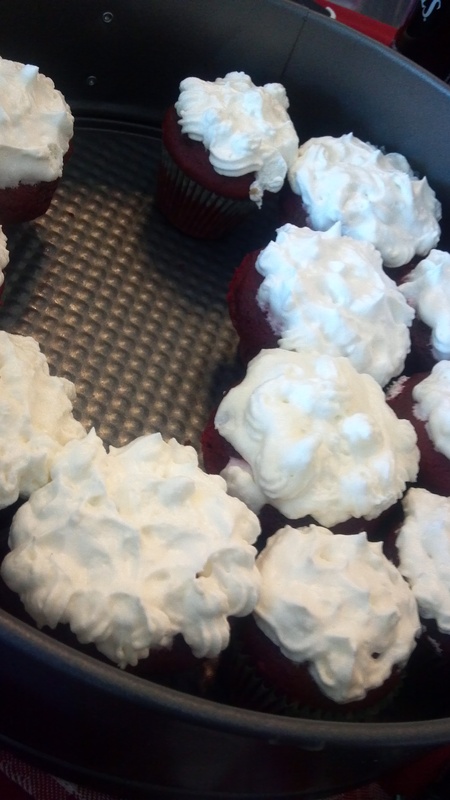 I heard she made a pretty mean red velvet and I, of course, wanted to put it up to the taste… and it completely passed! The cake was soft and fluffy. The frosting was slightly different. Instead of being made with all cream cheese, it was a mix of whipped cream and cream cheese. So, for those not-so-lovin’-frosting fans, this is the frosting for you! It was not too sweet and so refreshing! Both of these desserts were fabulous. 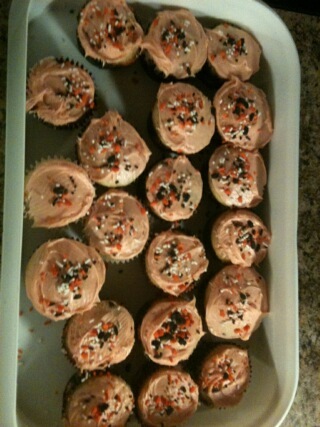 If Mallory decided to drop out of school and become a full-time baker, I would be her number one customer. After both of these treats, I was in a sugar coma! Of course, a sugar high was all I need to gear up for another night at the Rodeo! If you’re ever in the Reno area, be sure to stop by their restaurant! Sorry to say, you won’t get any of Mallory’s treats, however, their menu is filled with delicious items. I hear their homemade bread pudding is pretty spectacular! In one of my last weekends in Kansas City, I went over to my friend’s house for a farewell BBQ. Grilling out, drinks, friends and good times… And cupcakes?! 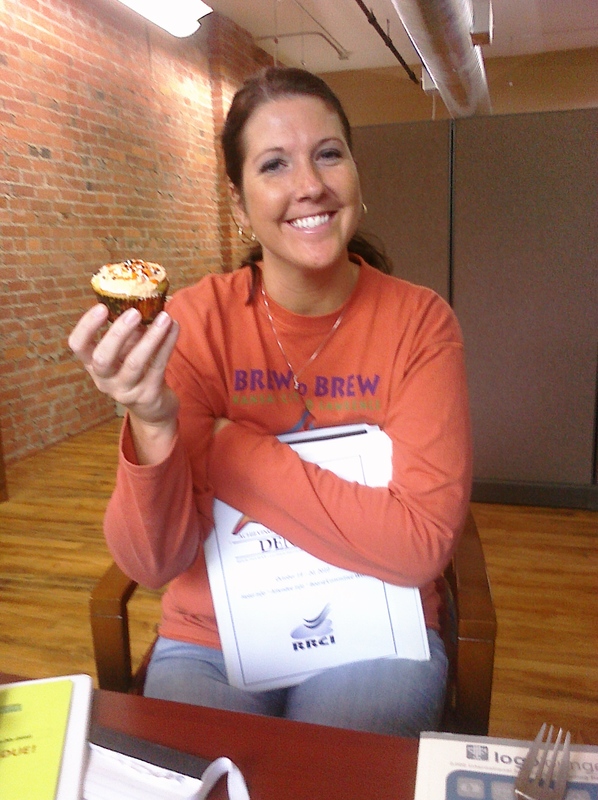 As a complete surprise, I was graced with the lovely cupcakes from my friend and fellow cupcake/baking foodie, Kristen. When these bad boys were opened, banana flooded the entire room. And it only got better from there…. Wow. Ultra moist, banana infused, and sweet down to the core. I had one of my “ahhhh” moments with this frosting. I almost fell off the chair…. It was rich, creamy, and it simply tasted fantastic. All the vanilla flavor with a hint of banana. Nothing fancy with the presentation of the cupcakes. 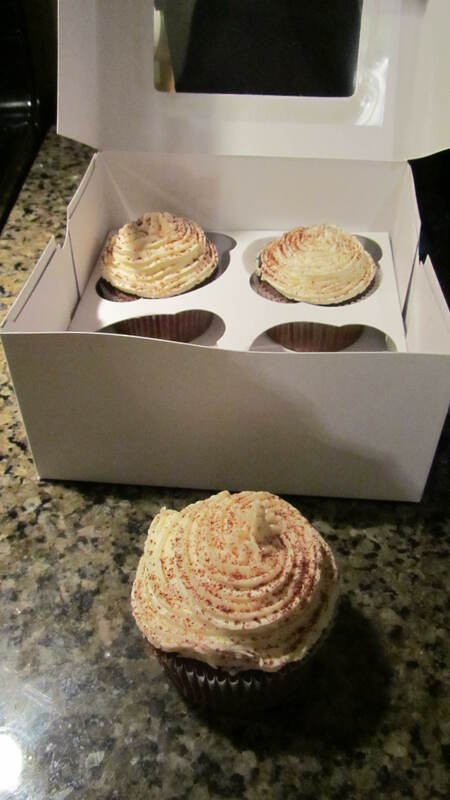 Packed in handy carry-all container and wrapped in a decorated cupcake holder, these cupcakes swirled to the top were ready for the party! 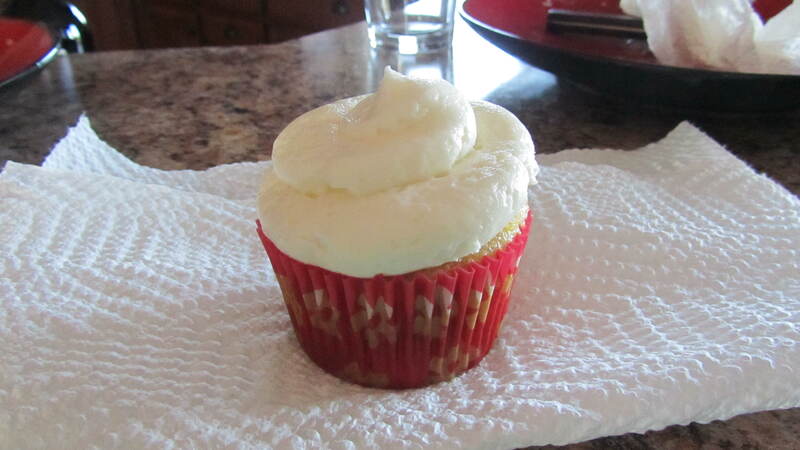 With the storage of the cupcakes, the banana flavor seeped up into the vanilla frosting. I’m sure that wasn’t the intention; however it was very welcomed flavor. It enhanced the banana experience to make it a full-blown flavor explosion! One of my roommates, Ashley, asked the other, Katie, if she wanted to split one. Katie agreed. However, after Ashley took her first bite, her eyes said it all. Needless to say, she did not share with Katie and Katie fully enjoyed a whole one to herself! Thank you Kristen for the cupcakes and thank you Casey for hosting! I’m going to miss you ladies! 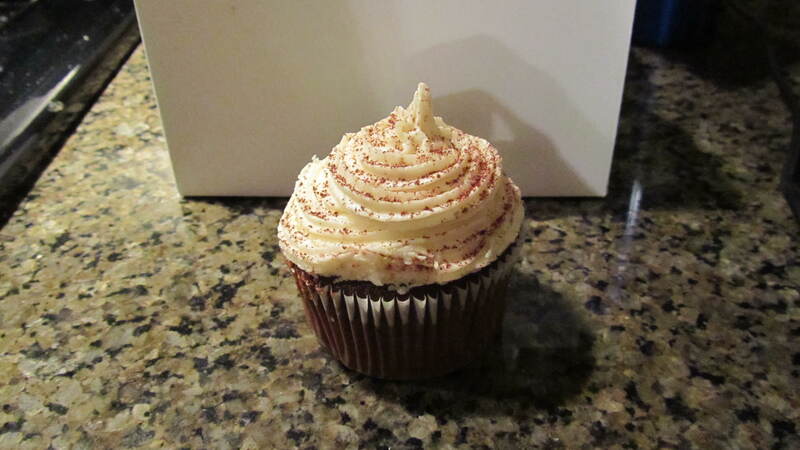 To jumpstart my New Year’s resolution (which is to eat AND bake more cupcakes), I decided to make NYE cupcakes! Read all about my baking experience on my Baking page. Just be sure to scroll all the way to the bottom! Ghosts, goblins, witches, Lady Gaga—are just a few of the top scary costumes I’ve seen this Halloween. Who would want to be something scary, when you can be something sweet?! Naturally, I chose be the sweetest thing I could imagine, a cupcake! I searched far and wide to find a place that had this costume in stock. Apparently, this costume was a popular item this Halloween. Lucky for me, I finally found one at Costume Express and lucky for me again, the costume arrived just a few mere days before Halloween! 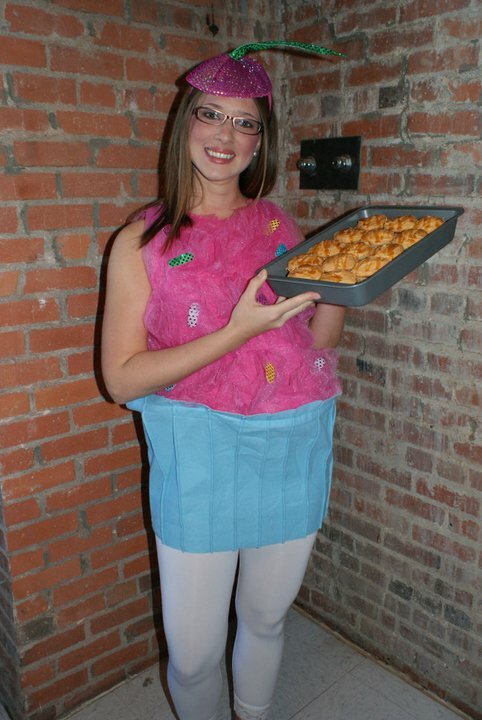 Well, I couldn’t come dressed up as a cupcake without cupcakes in hand! 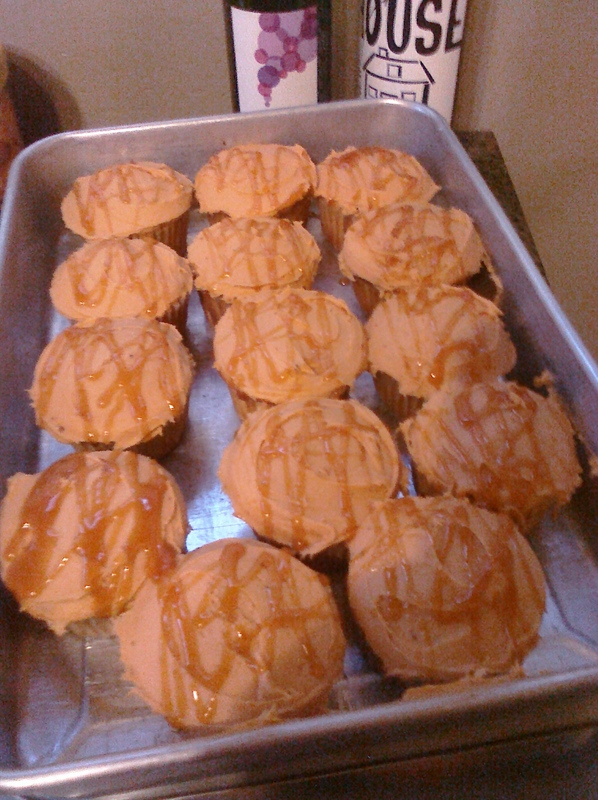 I decided to try my hand at bakeitinacake’s pumpkin pie cupcakes. Boy, were they a hit! It was my first attempt at baking cupcakes from scratch, so I was a little nervous about the reviews. After I heard great raves one after the other, I could breathe easy. Then, I decided to try the fruits of my labor, and yes folks, they were delicious! Besides just making cupcakes, I had to schedule a visit from Kansas City’s very own mobile cupcakery! 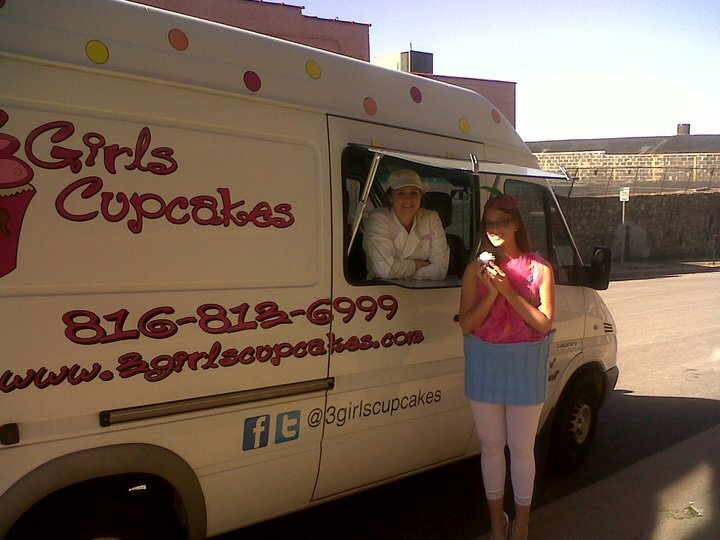 3GirlsCupcakes made a special stop to check out my “sweet” costume (pun totally intended). I never knew I was going to become a “cup-a-vore” (a cupcake eating a cupcake). Does anyone have any other great Halloween costumes to share? Tell me about them! Early one morning last week, I was excited to see a picture message of a pan full of cupcakes come across my phone. I know that the sight of cupcakes excites me, but the joy is even greater when others remember my love for them. After receiving the message, I jokingly replied, “Are you bringing those to the office”. To my great surprise, I get a call later in the day, saying that my cupcake is awaiting me! Nothing excites me more than knowing I’m about to have a cupcake! My friend and co-worker, Casey brings up the Halloween cupcake that she and her two little girls, Taylor (7) and Riley (4) made the night before. 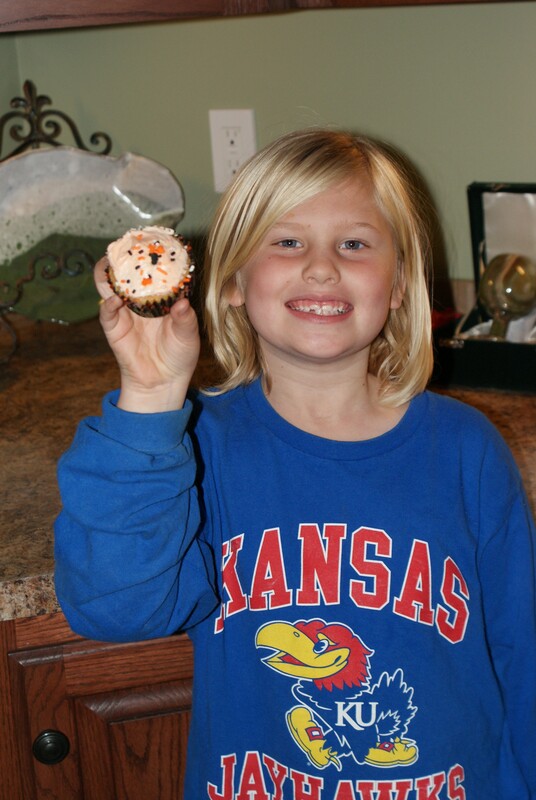 Taylor and Riley, my “adopted” nieces specifically picked out one of their homemade, hand-decorated, Halloween cupcakes for me. Just for me! 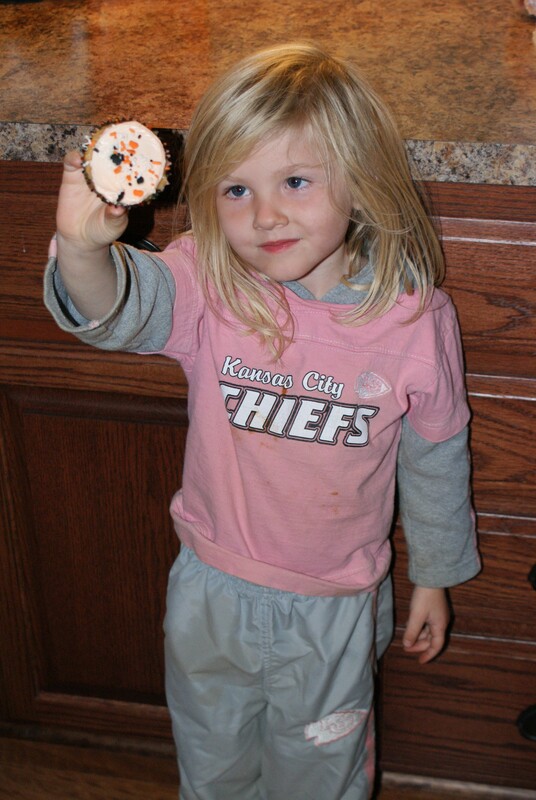 The cupcake was a delicious vanilla cake with Halloween sprinkles dotted throughout. Orange vanilla frosting topped off the cake, and Halloween ghosts and bats completed the look. There’s no doubt in my mind that this was the best cupcake I have ever tasted! It was made with love. Nothing can ever top that.